How is this even possible??? Women are often thought of as picky, especially where men are concerned. Some single women are known to have lists of characteristics that their ideal man must possess, like great abs, a sense of humor, a six-figure income, and a nice car. When a woman meets a potential mate, she has to decide which of these traits are deal-breakers and which she can let go. No matter how selective a woman might be, some have strict physical attributes from their must-haves list, as an OkCupid study found that women find 80 percent of men unattractive. 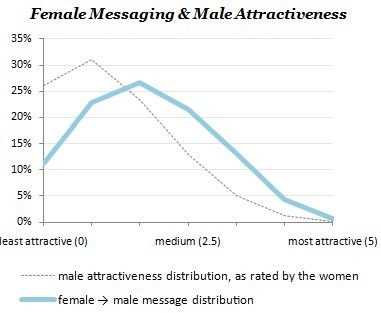 If you look at the gray line, you can see that women rate a whopping 80 percent of men as worse-looking than medium. That's pretty harsh, ladies. On the other hand, when it comes to actually making contact with a potential date, women shift their expectations only minimally ahead of the curve, which is better than the males who go after the women that are way out of their league. With basic ratings so off-kilter, the two curves suggests some unique interpretations of the female thought process. The most striking one is that the average-looking female believes that most men aren't hot enough for her, but she decides to message them anyway. To show that some women may be operating on a very different scale, OkCupid shared some pictures of men who are fine-looking, some might say cute even, but that women have rated them as significantly less attractive than the so-called medium. OK, maybe none of them are Ryan Gosling, but if they weren't Ryan Gosling, would you still rate them high on the hot meter? From this, one might think that it's the female, not the male, who has unrealistic standards of what the average male should look like. It seems like women are way beyond picky.